Background: Many individuals with traumatic brain injury experience difficulties with social behavior, some of which are attributed to difficulties in regulation of emotions. Objectives: The aim of this study was to compare the difficulties in emotional regulations of patients with mild traumatic brain injury (MTBI) and normal controls. Patients and Methods: In this cohort study, 72 patients with MTBI and 72 normal controls with similar gender were selected. Difficulties in Emotion Regulation Scale (DERS) and Positive and Negative Affect Schedule (PANAS) questionnaires were completed for both the study groups at the beginning of the study and 6 months later. The data were analyzed using multiple linear regression, Chi-square, and paired t-test. Results: The results showed that there was a significant difference between MTBI patients and normal controls in all subscales 6 months after MTBI, and in the total score of DERS, except for the nonaccepted scale and PANAS (P = 0.001), in which no significant difference was observed. In addition, the results of multivariate regression showed that trauma (β = 0.493), age (β = −0.196), familial history of mental disorders (β = −0.185), and financial status could predict emotional regulation (β = 0.148). Conclusions: It seems that mild traumatic brain injuries may be the cause of problems in social behaviors. Traumatic brain injury is one of the most common types of trauma and is the second leading cause of death in various accidents. Most of the injured people are individuals under the age of 30 who constitute the productive and youthful forces of the community. Despite the improvements in hospital services and the system of care for traumatic brain diseases, we are unfortunately seeing that after days, weeks, months, and even years after the trauma, patients develop emotional problems that affect their personal health, their family, and even their society. Therefore, identifying the factors that cause traumatic brain injury has become the focus of research efforts in recent years. One of these influential variables is emotional regulation. Various theories agree that effective emotional regulation includes emotional awareness and assessment skills, emotional regulation, compromised use, and adaptation of excitement. The adjustment of emotion is consistent with adaptation and social interaction, and increases the frequency of positive emotional experience and effective coping with stressful situations, and even improves the reactive activities to respond to social situations. The role of excitement in health and disease is recognized as a major factor in psychological adjustment, but no psychological research has not been considered until emotional regulation has attracted much attention as a factor in the interaction between mental disorder and health. Considering that few studies directly examine the subject of this research and lack of a history of such studies in Iran, this study is of a nonspecific nature and has its own specific types of subject matter and explanation. This study was designed to compare the difficulties in emotional regulations of patients with mild traumatic brain injury (MTBI) and normal controls. This is a cohort study on 72 cases of head-injured patients who were admitted to one of the hospital neurosurgery services of Iran and 72 normal controls were selected through convenience sampling. The two groups were matched in terms of gender. Considering the frequency of 2% mental disorder in healthy individuals and 43% in moderate traumatic patients, the minimum required sample was calculated to be 72 in each group with 95% confidence and 90% probability. Patients with headache, dizziness, and vomiting for more than 3 days in spite of GCSS of 15. Patients with any evidence of spinal cord injury, previous nervous system disease, such as brain tumors and cerebrovascular accidents, patients in vegetative state, or with communication problems and psychotic diseases as well as patients with mental retardation, and those who were not willing to contribute to the study were excluded from the study. After examining the patients and confirming that they had TBI and had the criteria for entering the research, their information was recorded by a neurosurgeon in two researcher-made questionnaires related to neurological disorders of the brain and demographic evaluation. Subsequently, patients were asked to come to one of the hospitals in Iran to complete the questionnaires after 6 months. In addition, the follow-up method for normal controls was similar to that of the TBI group. The duration of the group's follow-up was 6 months. By selecting the appropriate individuals in this group and having the inclusion criteria, they were asked to go to hospital after 6 months to complete the questionnaires. Difficulties in Emotion Regulation Scale (DERS) questionnaire was designed in 2004 by Gratz and Romer to assess multiple aspects of emotional regulation and dysregulation. This scale has 36 items answered based on a five-point Likert scale (from “never” to “always”). Lack of emotional clarity (clarity). A Persian version of DERS was used in this study. Internal consistency for total DERS was determined by Cronbach's alpha coefficient (0.93 estimation) in an Iranian sample. Furthermore, validity and reliability of this questionnaire were assessed by Mirzaei M.
The score between 33 and 72 indicates the difficulty in emotion regulation at a low level. The minimum possible score is 33 and the maximum score is 180. The score between 72 and 108 indicates the difficulty in emotion regulation at an average level. The score above 108 indicates the difficulty in emotion regulation at a high level. Statistical analyses were performed using IBM SPSS Statistics, version 16 (Chicago, Illinois, USA). Data analysis was performed using paired t-test for the comparison of the mean pre and posttest injury. For inquiry of demographic variables, which affect the emotional regulation, the linear multivariate regression with P < 0.05 was used. Furthermore, the covariance analysis was used to compare the difference between DERS (6) and Positive and Negative Affect Schedule (PANAS) (6) for both groups of MTBI patients and healthy people. Seventy-two patients with MTBI and 72 normal controls were included in this study. The mean age of traumatic brain injured people was 34.43 ± 12 years and the mean age of normal controls was 34.75 ± 11.63. Both groups were matched according to gender. In addition, 57 (79.2%) of patients plus 62 (86.1%) normal controls had poor economic status [Table 1]. History of mental disorders was positive in first-degree relatives in 28.7% of MTBI patients and 13.9% of normal controls (P = 0.04). 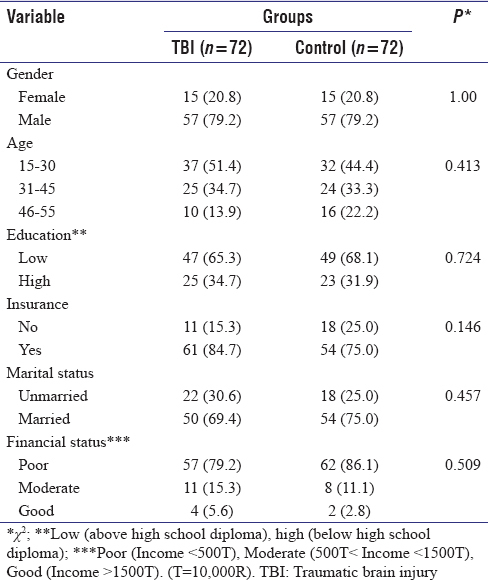 37.5% in MTBI group and 18.1% in normal controls had history of hospitalization (P = 0.009). In addition, 13.9% of MTIB and 1.4% of normal controls had a history of head injury (P = 0.005). [Table 2] shows the mean and standard deviation of subscales and total DERS scale in TBI and normal controls at the beginning of the study and 6 months later. The comparison between the emotional regulation values at the beginning (DERS ) and 6 months later (DERS ) show that there is a significant difference between the means in TBI patients (P < 0.001). This showed difficulties in regulation of emotions in this group. However, these values for normal controls showed that there was no significant difference between the means for normal controls (P > 0.05). Moreover, a comparison between mild traumatic brain patients and normal controls according to the nonacceptance scale showed that there was no significant difference at the beginning and 6 months later for both groups (P > 0.05). Moreover, another comparison at the beginning (called PANAS ) and 6 months later (PANAS ) in both groups of mild traumatic brain patients and normal controls showed that there was a significant difference between the groups at PANAS (0) and PANAS (6) only among mild traumatic brain patients (P < 0.001) both positive and negative emotion. On the other hand, the covariance analysis was used to compare the difference between DERS (6) and PANAS (6) for the both groups based on the beginning scores (DERS (0) and PANAS (0)) as the covariate factors. The results of covariance analysis indicated that the effect of the studied groups on the DERS (6) and PANAS (6) scores was statistically significant (F (1,197) =152.33, P < 0.001) [Table 3]. To evaluate the effect of the demographic variable factors on emotion regulation, the multivariate linear regression model was applied and the selection of input variables was done by the “enter” method. The variables of age, gender, economic status, relationship, and history of mental disorder in first-degree relatives, history of substance use, history of hospitalization, and history of trauma were entered into the regression model as independent variable and overall score of difficulty in regulating emotions was entered as dependent variable. The results show that only the variables of age (β = −0.196, P = 0.01), history of mental disorder in first-degree relatives (β = −0.185, P = 0.01), economic status (β = 0.148, P = 0.04), and history of alcohol use (β = 0.291, P = 0.00) still remain in the model and have relationship with difficulty in regulating emotions. Moreover, the multivariate linear regression model results show that being in healthy group reduces the difficulties of regulation of emotions (P < 0.001). In addition, there are negative ratios between overall scores of difficulty in regulating emotions (dependent variable), age, and history of mental disorder of first-degree relatives. [Table 4] shows the model summary. The aim of this study is to make a comparison between mild brain traumatic patients and healthy people according to their difficulty in regulating emotions. According to the results of this study, the DERS average score of traumatic brain patients 6 months after TBI was 102.36 ± 14.65, whereas this number was 94.80 ± 18.23 for normal controls. Furthermore, there is no significant difference between the two groups in terms of nonadmission subscale after 6 months (P > 0.05), whereas regarding other subscales, there are some differences that show that even mild brain traumatic injury may cause some difficulties in controlling patient's emotions after 6 months despite normal CT scan results. Therefore, timely attention may reduce the difficulties of regulating emotions in these patients. In addition to some other studies on adults and children,,, the results of this study has shown that they experience more difficulties in regulating emotions. However, there is not any comparative study on mild brain traumatic injury after 6 months. Mean PANAS score shows a significant difference between the two groups (P < 0.001). The means positive emotion 6 months after TBI for mild brain traumatic patients was 10.61 ± 25.25 and it was 13.8 ± 2.4 for normal controls. In addition, mean negative emotion for minor brain traumatic patients was 14.71 ± 3.41 and it was 11.51 ± 2.73 for normal controls. Results of this study show lack of control of negative emotions in mild brain traumatic patients. Moreover, the results of some studies, show that whenever patients experience more negative emotions they encounter more difficulties such as loss of concentration in doing purposeful actions. It seems that the intensity of negative emotions in such behaviors depends on their flexibility and whenever emotions have suitability with situation they will motivate positive reaction; otherwise, they will cause negative reaction. According to multivariate linear regression analysis, the most effective variable in difficulty of regulation of emotions is associated with the patient's group (β = 0.493, P = 0.001). In other words, being in patients groups, even mild ones, may cause difficulties in regulating emotions. Overall, nature and essence of traumatic brain injury is very complicated and we should not ignore the countless affective factors such as demographic, biological, medical, and psychological factors. Therefore, evaluating difficulties of regulating emotions following TBI is in its early stages and still needs more development. Moreover, we still need more investigation and research in this field to identify the factors effective on difficulties of regulating emotions. Negative age variable shows crucial role in regulating emotions among other demographic variables (β = − 0.196, P = 0.013). In other words, increase in age reduces the difficulties in regulating emotions. The result of this study is not consistent with some other studies,, which show that injury at young age may improve the difficulties of regulating emotions. On the other hand, this study is consistent with a study by Kennedy et al., which indicates that increase in age allows people to adapt themselves to difficulties. Moreover, the results show that the variable of economic status has a significant relationship with difficulties in regulating emotions (β = 0.148, P = 0.041). The results of this study are comparable with others., It seems that people with poor economic status or low income deal with hospital costs and as a result have difficulties in controlling negative emotions. Moreover, another effective variable still exists and it is the history of mental disorder in first-degree relatives. On the one hand, difficulties of regulating emotions may lead to the growth of mental disorder, reduction of social activities, and finally impose high pressure on care system, society, and even the patient's family. On the other hand, results of some studies show that there is a significant relationship between depression and difficulties of regulating emotions,, so it is possible that history of mental disorder of first-degree relatives not only increase the difficulties but also influence recovery progress after a trauma. It seems that people who are in depressing environments will not be able to endure difficulties and deal with it. Emotional regulation is defined as the arrangement and coordination of the emotional processes. Derangement and irregularity in these processes may result in failure of one's ability to experience, to use or to express emotions. It is shown that exposure to repeated negative emotional events, goal-oriented behaviors such as concentration and problem solving will be disturbed. The severity of these changes depends on the capability of the patients to arrange their emotions and flexibility in application of their potentials. It is also shown that alcohol abuse results in impairment in emotional awareness and impulse control. These changes may continue until the end of their treatment. Difficulty in impulse control is usually associated with recurrence of drug abuse. These findings are compatible with our findings, although the opposite results have been found by others (42, 43). It can be stated that mild head injuries, just as the more severe events, may result in difficulties in emotional regulation. Considering the fact that these patients are the most common group of head injuries and while they grossly appear to be normal, the above-mentioned disturbances may result in delay in their recovery or even further, psychological injuries, more attention should be paid to this aspect of their recovery during follow-up, and better research plans are mandatory. Bedgood A, Rand SE, Major J Jr. Occult retinal detachment after mild traumatic brain injury: Case report and literature review. Clin J Sport Med 2015;25:e26-7. Miles SR, Graham DP, Teng EJ. Examining the influence of mild traumatic brain injury and posttraumatic stress disorder on alcohol use disorder in OEF/OIF veterans. Mil Med 2015;180:45-52. Titus DJ, Furones C, Atkins CM, Dietrich WD. Emergence of cognitive deficits after mild traumatic brain injury due to hyperthermia. Exp Neurol 2015;263:254-62. Coelho C, Le K, Mozeiko J, Krueger F, Grafman J. Discourse production following injury to the dorsolateral prefrontal cortex. Neuropsychologia 2012;50:3564-72. Gratz KL, Romer L. Multidimensional assessment of emotion regulation and dysregulation: Development, factor structure, and initial validation of the difficulties in emotion regulation scale. J Psychopathol Behav Assess 2004;26:41-54. Mathews BL, Kerns KA, Ciesla JA. Specificity of emotion regulation difficulties related to anxiety in early adolescence. J Adolesc 2014;37:1089-97. Woodward SH, Shurick AA, Alvarez J, Kuo J, Nonyieva Y, Blechert J, et al. A psychophysiological investigation of emotion regulation in chronic severe posttraumatic stress disorder. Psychophysiology 2015;52:667-78. Mooney G, Speed J. The association between mild traumatic brain injury and psychiatric conditions. Brain Inj 2001;15:865-77.
khanzadeh M, Saidiyan M, Hosseinchary M, Edrissi F. Factor structure and psychometric properties of difficulties of emotional regulation scale (Persian). J Behav Sci 2012;6:96-87. Mazaheri M. Psychometric properties of the persian version of the difficulties in emotion regulation scale) DERS-6 and DERS-5-revised (in an Iranian clinical sample. Iran J Psychiatry 2015;10:115-22. Mirzaei M. Emotional, Cognitive and Metacognitive Predators of Procrastination in College Students. MA Thesis in Clinical Psychology Tehran University of Medical Sciences; 2011. Tonks J, Williams WH, Frampton I, Yates P, Slater A. Reading emotions after child brain injury: A comparison between children with brain injury and non-injured controls. Brain Inj 2007;21:731-9. D'Avanzato C, Joormann J, Siemer M, Gotlib IH. Emotion regulation in depression and anxiety: Examining diagnostic specificity and stability of strategy use. Cogn Ther Res 2013;37:968-80. Alexander MP, Stuss DT, Picton T, Shallice T, Gillingham S. Regional frontal injuries cause distinct impairments in cognitive control. Neurology 2007;68:1515-23. Sheppes G, Scheibe S, Suri G, Radu P, Blechert J, Gross JJ. Emotion regulation choice: A conceptual framework and supporting evidence. J Exp Psychol Gen 2014;143:163-81. Campbell-Sills L, Barlow DH, Brown TA, Hofmann SG. Acceptability and suppression of negative emotion in anxiety and mood disorders. Emotion 2006;6:587-95. Babbage DR, Yim J, Zupan B, Neumann D, Tomita MR, Willer B. Meta-analysis of facial affect recognition difficulties after traumatic brain injury. Neuropsychology 2011;25:277-85. Pineau H, Marchand A, Guay S. Specificity of cognitive and behavioral complaints in post-traumatic stress disorder and mild traumatic brain injury. Behav Sci (Basel) 2015;5:43-58. Harley CR, Gandhi S, Heien H, Nelson SP. The comparative effectiveness of rosuvastatin vs. other statins in patients with an increased risk of failure to reach NCEP ATP III goal. Int J Clin Pract 2008;62:889-95. Ruiz-Aranda D, Salguero JM, Fernandez-Berrocal P. Emotional intelligence and acute pain: The mediating effect of negative affect. J Pain 2011;12:1190-6. Folkman S, Lazarus RS. Stress processes and depressive symptomatology. J Abnorm Psychol 1986;95:107-13. Carver CS, Johnson SL, Joormann J. Serotonergic function, two-mode modes of self-regulation, and vulnerability to depression: What depression has in common with impulsive aggression. Psychol Bull 2008;134:912-43. Kennedy MR, Wozniak JR, Muetzel RL, Mueller BA, Chiou HH, Pantekoek K, et al. White matter and neurocognitive changes in adults with chronic traumatic brain injury. J Int Neuropsychol Soc 2009;15:130-6. Max JE, Pardo D, Hanten G, Schachar RJ, Saunders AE, Ewing-Cobbs L, et al. Psychiatric disorders in children and adolescents six-to-twelve months after mild traumatic brain injury. J Neuropsychiatry Clin Neurosci 2013;25:272-82. Laaksonen E, Martikainen P, Lallukka T, Lahelma E, Ferrie J, Rahkonen O, et al. Economic difficulties and common mental disorders among finnish and British white-collar employees: The contribution of social and behavioural factors. J Epidemiol Community Health 2009;63:439-46. Bardeen JR, Kumpula MJ, Orcutt HK. Emotion regulation difficulties as a prospective predictor of posttraumatic stress symptoms following a mass shooting. J Anxiety Disord 2013;27:188-96. Berna G, Ott L, Nandrino JL. Effects of emotion regulation difficulties on the tonic and phasic cardiac autonomic response. PLoS One 2014;9:e102971. Contardi A, Farina B, Fabbricatore M, Tamburello S, Scapellato P, Penzo I, et al. Difficulties in emotion regulation and personal distress in young adults with social anxiety. Riv Psichiatr 2013;48:155-61. Sher KJ, Grekin ER. Alcohol and affect regulation. In: Gross JJ, editor. Handbook of Emotion Regulation. New York: Guilford Press; 2007. p. 560-80.